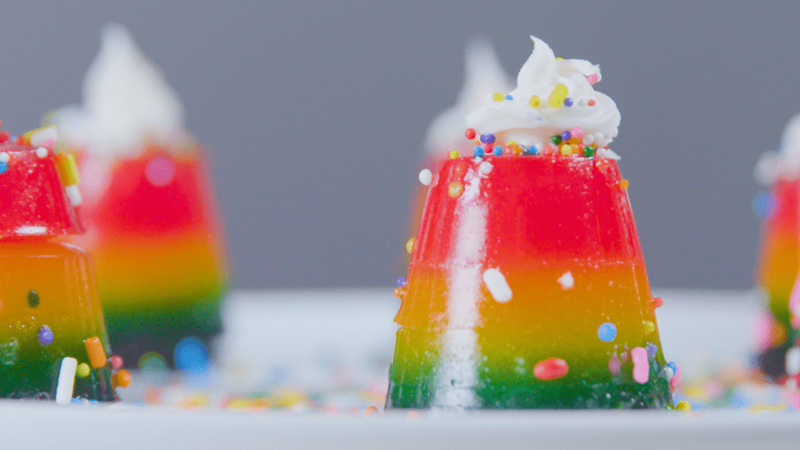 These colorful, beautiful layered jello shots are perfect for any adults-only celebration. Using flavored vodka, these jello shots have a delicious funfetti flavor and a creamy texture that makes them irresistible. Spray a silicone mini muffin or candy-making pan (cavity volume = 2 to 4 tablespoons) lightly with cooking spray. Wipe the excess spray from the pan so there is no visible residue. Put the mixture on a low heat. Heat and continually whisk until the gelatin evenly dissolves about 2 to 5 minutes. Be careful not to let the mixture come to a boil. Remove from heat and let the mixture cool a bit. Whisk in the vodka and sweetened condensed milk. Divide the mixture evenly into 6 separate bowls. Put a few drops of different colored food coloring in each and whisk to thoroughly mix. Spoon about 1 teaspoon of the first color mixture into the pan cavities. Refrigerate until set, usually about 20 minutes. But not too long because if they are sticky all the layers will set together better. Repeat with all colors, letting each layer set for about 15 minutes. Refrigerate overnight. The shots should slide easily out of the muffin pan but you may need to do some careful prodding with a small offset spatula. Once out, you can top with frosting and sprinkles.